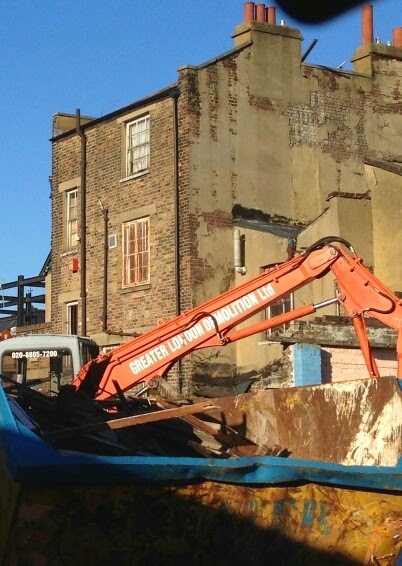 Demolition of our Georgian houses has started. Murphy refused to wait for the Court of Appeal. 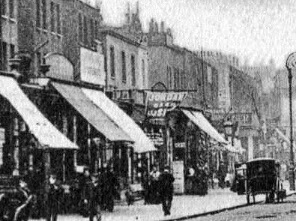 No 66 Dalston Lane is the old "Sound and Music"shop, an 1807 house. 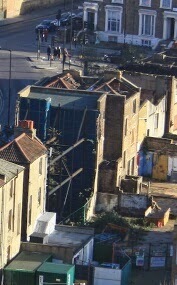 It is in Phase 1 of Murphy's demolition programme. Murphy started stripping out No. 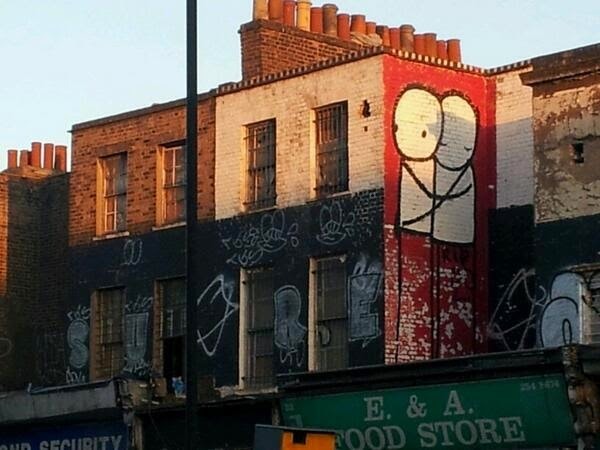 66 Dalston Lane last week. They removed all the windows and the chimney pots and all the roof tiles to let the rain in. 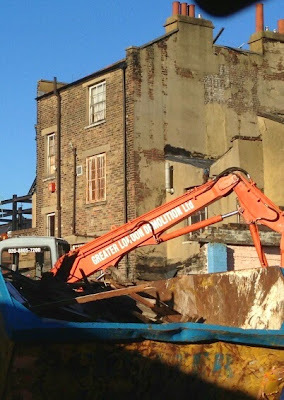 OPEN's solicitors wrote to request they cease demolition works until OPEN's case has been considered by the Court of Appeal. Murphy have refused, saying they've been delayed long enough already. OPEN has now applied to the Court for a hearing when it will ask for an injunction to stop the demolition until its appeal is heard. 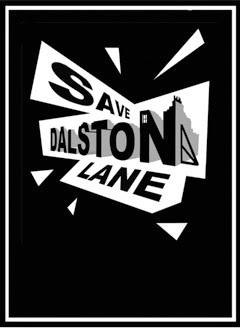 If you see heavy equipment on site, or contractors damaging the houses, please immediately contact SaveDalstonLane on twitter or facebook . OPEN solicitors may then need to make an application to the Court for an injunction to stop them. 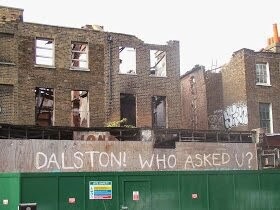 OPEN has today filed an application in the Court of Appeal for permission to appeal against the decision of a High Court Judge that he could not to stop the demolition of our Georgian houses in Dalston Lane. 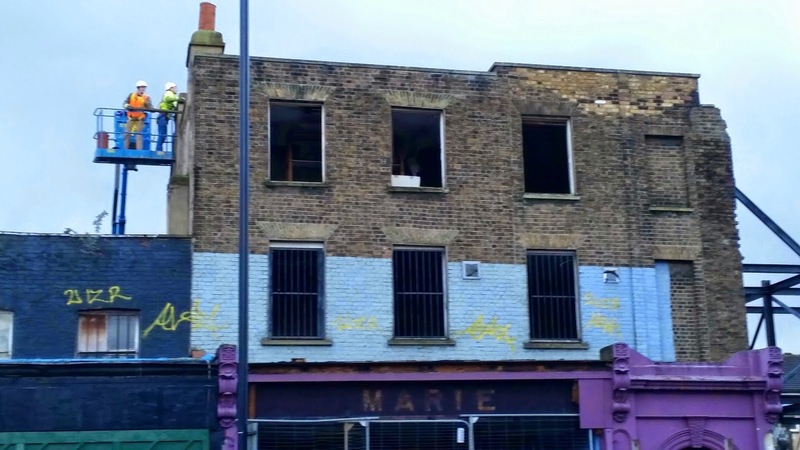 The Judge could find no procedural error which would enable him to overturn the planning permission, given by Hackney Council last March to its development partner Murphy, to demolish the sixteen antique houses. You can read about the Judge's decision here. Also today the Spitalfields Trust, after waiting months and months, had a meeting with Hackney's Property Services officers. 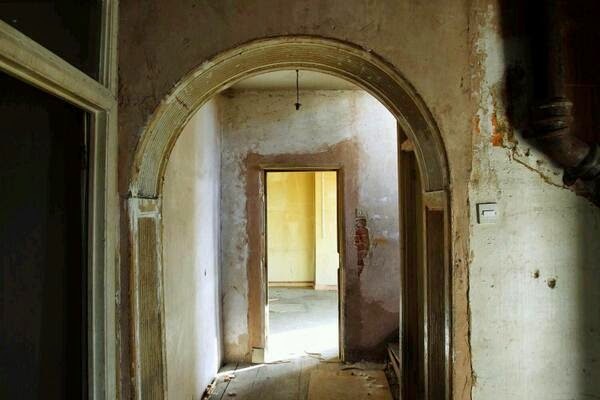 The Trust presented a genuine conservation scheme which not only involves restoration faithful to the antiquity of the 1807 houses, but also involves developing the remainder as 24 affordable flats in partnership with a housing association. ( What more could be of public benefit! Ed ) You can read about the Spitalfields Trust scheme here. The Hackney/Murphy scheme involves complete demolition and building bogus replica houses "in heritage likeness" and provides no affordable housing at all. The Trust now awaits Hackney's response to its proposal. 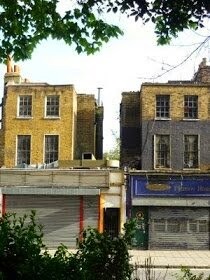 If you oppose the demolition of our Georgian houses, and support the Spitalfields Trust scheme, please sign the petition here and, even better, add your comments. The petition and comments will be sent to Hackney's Mayor Pipe - who still hasn't replied to OPENs letter offering to arrange a meeting for him with Spitalfields Trust. 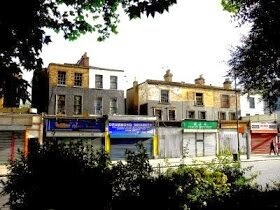 OPEN has had a rollercoaster battle in trying to save these houses from municipal vandalism which began many years ago. We have been supported financially and in spirit by local and national amenity societies and by many eminent people. 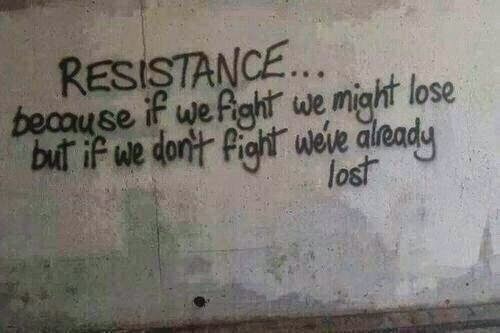 The Judge's decision was a sad and heavy blow to our campaign but it is the numerous smaller donations from the Dalston community which have inspired us to carry on! These sums have added up to over £10,000!! But more is now needed and we urge everyone to give what more they can to fund OPENs application to the Court of Appeal (Click here to donate). You can also buy quality campaign T-shirts and bags here which would also help us carry on the fight (Christmas present problems solved! Ed.). 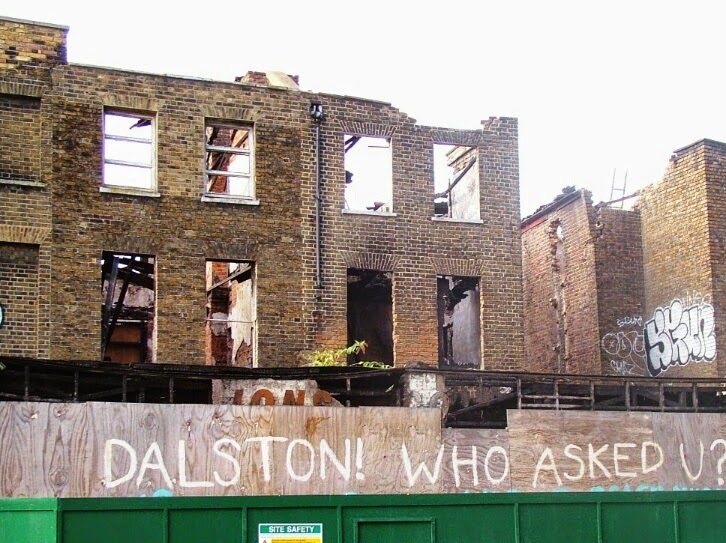 We have not given up hope that these surviving fragments of Dalston's history can be saved and be admired by future generations. We also hope that, by providing affordable homes, at least some of our local families won't be driven out of the community by the exhorbitant local rents. 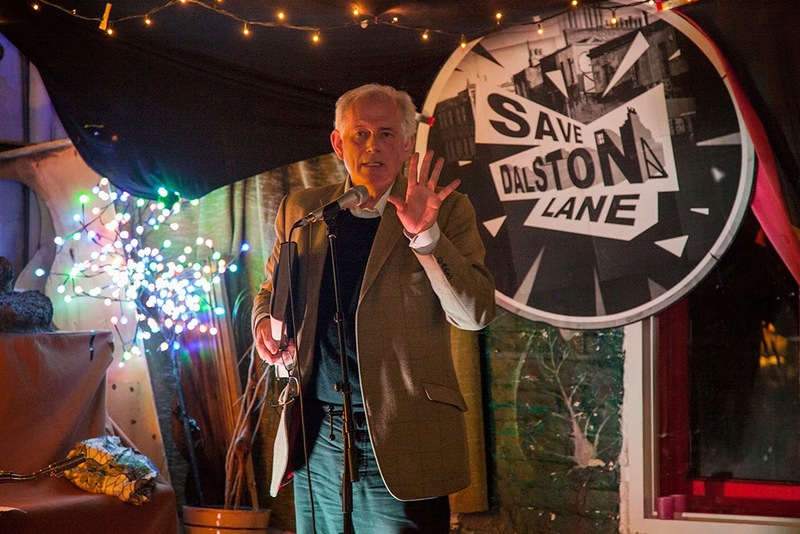 Dan Cruickshank, the eminent historian, writer and broadcaster,was one of our guests of honour at OPEN's fabulous fundraising soiree hosted at Dalston's Passing Clouds last Sunday 23 November. 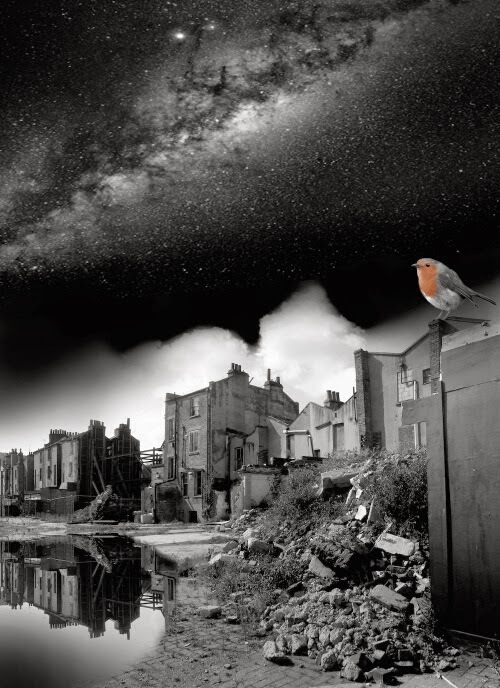 Dan expressed his fury that the history of Hackney, as illustrated in the Survey of London ," has been desecrated largely by Hackney Council itself . . ."
Dan went on: "I’ve got so many people to be angry with: English Heritage in particular. The fact that the terrace is not listed is a disgrace." "Every day I see beautiful and useable buildings destroyed in villainous circumstances: this is one of the most villainous stories I know about!" "NO MORE OF THESE BUILDINGS MUST BE DEMOLISHED because buildings represent continuity, identity, pride and memory. Memory is so important. You lose the buildings and you forget what you were, what these places were. . . 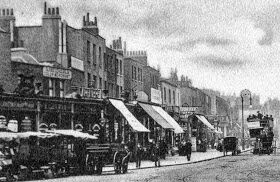 The fabric of this history is gone, largely swept away, which is why these houses in Dalston Lane are so incredibly important." "They are important for three reasons: they are beautiful, they absolutely have a possible future use as family homes, and they are part of the memory of what was here. They are also of major architectural importance and interest . . . as they capture a moment of English taste." "We appreciate around the world the Georgian city: Bath, Edinburgh, Bedford Square . . . these buildings are part of this great admired tradition. By some alchemy, some magic of god-given quality, those unlikely forces of speculative Georgian development created beauty that is inspirational, is much admired and loved, and is a model for urban living, a beautiful urban world, a ‘rus in urbes’. But no one knows, no-one cares because so much is gone." Dan concluded: "The Spitalfields Trust are absolutely determined, willing, ready and able to step in and take the buildings on. 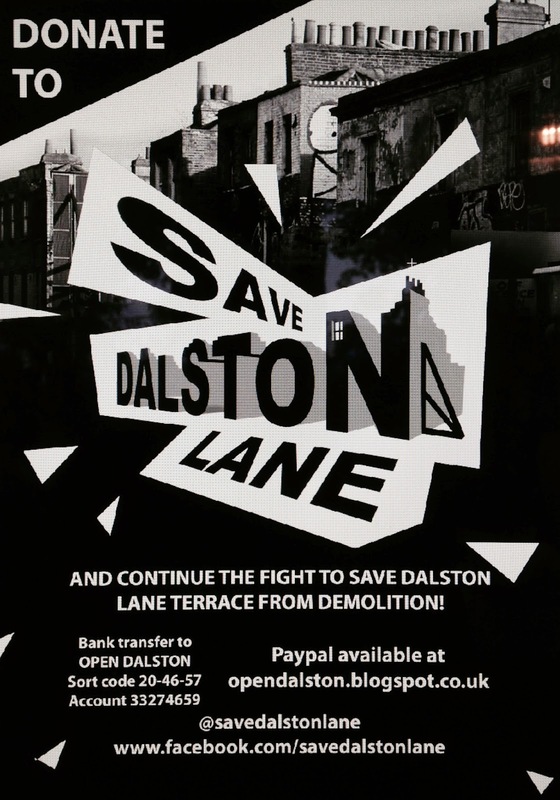 There should be something for everyone in Dalston by saving and developing the terrace in a sensitive and thoughtful way that preserves history."